The BiddyKins On-line store has been designed to give you as much freedom as a possible to add any combination of items to your shopping cart. The discounts highlighted on our specials page are automatically calculated and subtracted from your cart total - so it's really not necessary to purchase any specific pre-selected nappy bundles, you are free to add any combination of products to your cart. To help moms that are new to cloth, perhaps not entirely sure what to order and would prefer a little guidance, we've put together some suggested bundles. The links below open an Adobe PDF page in a new window that will guide you through adding the products to your shopping cart. You can print it out, or simply switch between the windows as you work your way through the guide. 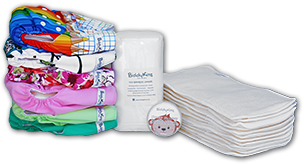 This is a simple checklist that guides you through adding a few different nappy designs and fabric types to your cart so that you can try several different cloth nappy types and see what works best for you. This is a suggested bundle of products that really gets you started on your cloth journey. It suggests which products to add to the cart - and how many of each to add.